August 22, 2018 | Meagan Miller & filed under CJSR, Fundrive, party, Special Events. CJSR has joined forces with Sweaty Palms and The Aviary to kick off FunDrive! On Monday September 3, join CJSR and Sweaty Palms at The Aviary for a warm-up FunDrive party. 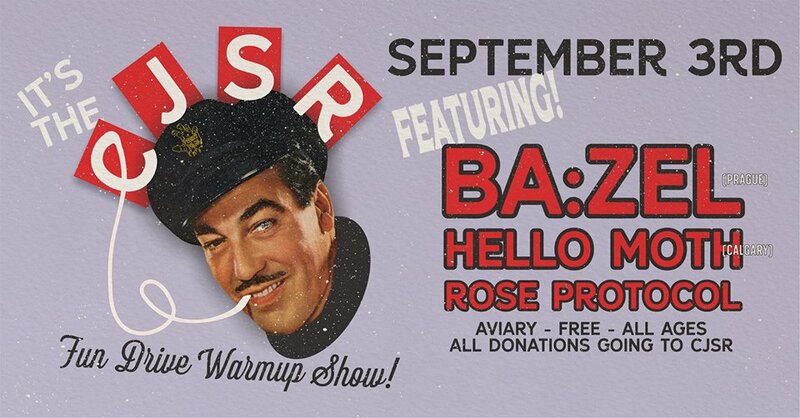 Live music from ba:zel (Prague), Hello Moth (Calgary), Rose Protocol, and special local guests TBA. The event is FREE and ALL AGES! All donations will go towards CJSR’s 2018 FunDrive! For more information please check out the Facebook event page.